How tall am I going to be? When will my child hit a growth spurt? What is my body fat percentage? How does my body composition affect my performance? How do I maximize my or my child’s full growth potential? With our Growth Analysis, we can determine how tall a child can potentially be, when their next growth spurt is, how much growth they have remaining and much more. And with one of our customized nutrition programs we can help each client unlock their full growth potential! With Champion Athletes Growth Analysis system we take over 24 measurements of your body, including height, sitting height, bone lengths, body fat percentage and more. 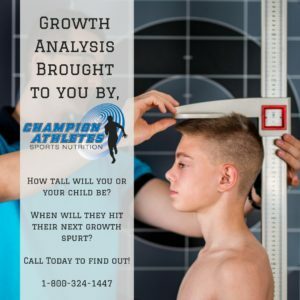 Once we have these measurements we use a program developed by endocrinologists across the country, and are able to predict: an athletes adult height, when they will hit their growth spurts and how their growth compares to over 18 million other boys and girls between the ages of 8 and 20. From wrestlers trying to determine their weight class for the upcoming season, to football players picking a position, or any other athlete trying to maximize their potential, knowing when you’re going to grow and by how much is extremely valuable. This information can also be extremely useful to those that might be concerned they are “below average” or experiencing delayed growth. There are many factors that can effect how you grow in terms of nutrition, from having too much or even too little body fat, to a lack of specific nutrients, our certified staff can help design a nutrition program to help unlock your full growth potential! Contact us today for a free consultation or to schedule a growth analysis!